With the world's first ACTIVEBlade technology, the Braun MultiQuick 9 is the best handblender for even the hardest jobs*. The unique technology makes the blade go up and down and they can blend even the hardest ingredients with 40% less effort, which means that you can focus on the recipe and on being creative. *compared to Brand handblenders without ACTIVEBlade techonology. *compared to Brand handblenders without ACTIVEBlade techonology. You get 2.5 times more active cutting zone which gives you tastier, smoother results with no unwanted pieces. The SPLASHControl technology ensures that your kitchen stays spotless and the POWERBell Plus gives you an extended cutting area that blends whole foods in seconds. The SmartSpeed ensures that the more you squeeze the more power you get and you can effortlessly use it with one single hand and change speeds without interruption. 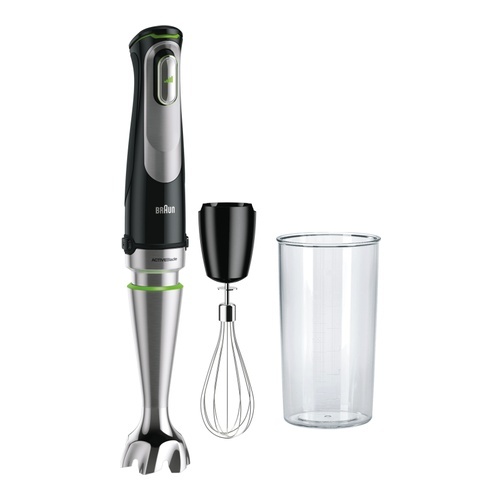 The handblender comes with a whisk and a 600 ml BPA-free plastic beaker with ml and fl oz measurements. With the world's first ACTIVEBlade technology, the Braun MultiQuick 9 is the best handblender for even the hardest jobs*. The unique technology makes the blade go up and down and they can blend even the hardest ingredients with 40% less effort, which means that you can focus on the recipe and on being creative. It comes with a whisk and a 600 ml BPA-free plastic beaker.